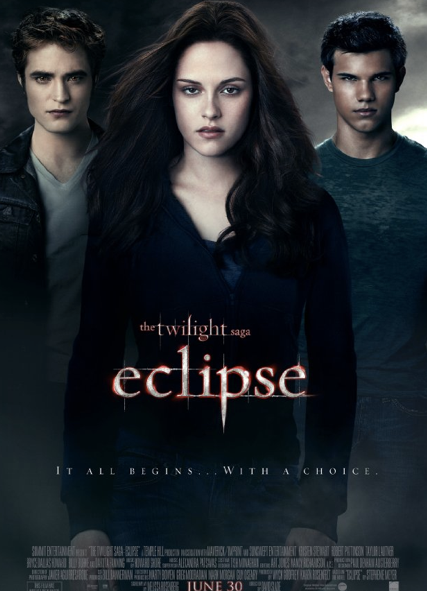 From the obnoxiously persistent tabloid coverage of the Pattinson-Stewart dating saga, to the recent Globe pictures of Vampire happy fans who showed up ten hours before the midnight premier, I was relatively determined to avoid seeing Eclipse at all costs months before its release. This third of the Twilight saga had, in my opinion, taken what was a first book I had yet to finish and a first movie which was entertaining though not especially impacting, beyond the brink of reason. When I heard that there were theaters showing all three films back to back with brief intermissions to refill on popcorn and tissues, my decision became a stone engraved stance against a nation-wide addiction. I expected to write a review of the future books presenting twelve step Twilight Detox programs before a review of one of these films. And yet - I saw Eclipse. No, worse. I saw Eclipse, and despite my most violent efforts to feel otherwise, acknowledged that it was a good freaking movie. The same Globe article that introduced me to the world of faux fang sporting super fans, informed me that 30% of the audience members who made Eclipse the second biggest movie opening ever, were male. This aids my confidence in believing that despite the film’s two abnormally appealing leading men, the base plot holds value for both sexes. Yes, Robert Pattinson and Taylor Lautner happen to be of the rare breed that may be capable of getting away with a good 20 minutes of screen time speaking in pig-latin before any heterosexual female employed senses beyond sight enough to notice. This oversight, however, wasn’t necessary (assuming that this didn’t occur for less than the allotted twenty minutes and, therefore, evade my radar). Both actors were adept at truly embodying their characters, enough so to make their joint obsession with our favorite misfit heroin Bella (Kristen Stewart) moving despite its occasional ridiculousness. By ridiculousness I mean scenes such as the one in which our morphing furry friend Lautner, earns a gold star in survival 101 by sharing a sleeping bag with Bella, while Edward curses his stone cold, blood dry self for not being up to the job of keeping his fiance warm from across the tent. Still, the passion and jealousy displayed by both vampire and wolf alike made for a satisfyingly entertaining, and impressively unpredictable, love triangle. Another aspect that upped the films anti was a serious rating change so far as fight scenes were concerned. I’m not one for gore but give me a good battle any day of the week; the fact that vampires don’t bleed made the good vs. evil face-off thrilling without being cringe worthy. The most common mode of execution was torn off limbs that seemed to detach and crumble as though they were made of fiberglass. I dug it. Granted, I had to laugh into my popcorn a few times at the appearance of the humungous fluffy puppy kindergarden crew that was the wolf pack, but what solid film is absent of these moments of light hearted blockbuster mockery? Ultimately, these stifled snickers were balanced with moments of mouth agape focus when the good vampires joined forces with the wolves to protect Bella from the ‘non-vegetarian’ vampire army, aka, the ones who hunt humans instead of wildlife. No, the battle scenes weren’t greek epic comparable, but I wont say that I wasn’t pretty pumped (“Get him!” or “Yes!” definitely escaped under breath at least a few times). So, there it is. Eclipse was sweet, I’d see it again. I’m considering catching up on the books and starting to build excitement for the fourth movie as far in advance as I began to build animosity towards the third. While I’m in the spirit of admitting to things, while ordering an iced green tea at Starbucks the morning after my induction into Twilight fan-hood, I saw the Eclipse CD for sale at the register; Stewart with that slightly distant, slightly depressed, look on her face standing between the set expressions of Pattinson and Lautner. Granted I didn’t know if Bella was deciding between Vampire and Werewolf or if the conflict was heroin chic runway vs. boy band commercial looks, nor did I care. Copped it. And yeah, I like that, too.